This is on top of all the other stressors we face in our daily lives, as well as “years of caring, of being on constant alert, of helping others with their troubles." "If you look at our modern lifestyle, you could say that we live in a culture of anxiety... We are all looking for ways to cope with this constant tide of anxiety. So please don’t think that it is somehow your fault that you feel this way." We could all benefit from taking a few moments out of a busy day to practice relaxed breathing and gentle exercises to improve posture and reduce muscle tension. One way to do this is through the gentle but powerful practice of qigong. 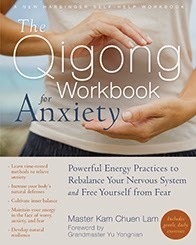 In The Qigong Workbook for Anxiety, a series of stress-reducing movements are clearly described, along with black and white photos of Master Kam Chuen Lam demonstrating correct posture. He also clearly explains the basic principles of the Taoist tradition and how they apply to contemporary life. According to traditional Chinese medicine, “Every human being is a field of energy. Energy doesn’t simply flow through us—we are energy.” This is an unfamiliar concept for most of us in the West, but you don’t have to be completely sold on the idea of qi flowing through your body in order to benefit from qigong practices. Why not try it for yourself? With permission from New Harbinger Publications, next week I'll post a sample activity: "Giant Strides" was designed for use on airplanes but is a great way to get the blood flowing and perk up your energy whenever you've been sitting for too long.